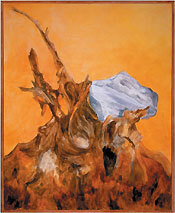 The Windham Art Gallery (WAG) is as vibrant in history as it is in its artwork. In the late '80s, local community members recognized the need for a space to strengthen the community and growth of local artists. Ideas sprouted around creating a high-quality exhibition experience, offering professional development for artists, facilitating artists' camaraderie, and encouraging artist interaction with the regional community. 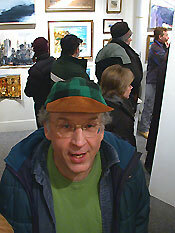 This energetic vision came true in 1989 when the Windham Art Gallery took form as a collaborative gallery under the auspices of the Arts Council of Windham County. WAG has come to be a vibrant community space by being managed cooperatively by its artist members with the help and support of a gallery coordinator and nonmember volunteers. 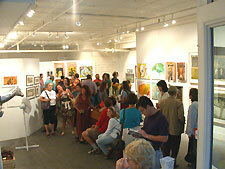 Over the past 14 years, WAG has maintained its reputation as a dynamic venue for quality artwork and for education. It has provided a home for a large number of emerging and established artists, encouraging the development of new and experimental work. Additionally, the gallery has played a significant role with arts education through its exhibits, workshops, drawing groups, and other public events. Current member Melissa Scheid Frantz summarizes her WAG experience as "one that has helped me optimize my potential as an artist through the encouragement of fellow artists and the opportunity to show my work as much as possible to the local community and visitors." The process of developing the gallery's exhibits is as exciting as the exhibits themselves. Members may show their work as often as they find suitable. Exhibits rotate monthly, and themes are developed by the membership. Reflecting the gallery's mission, themes can be as creative and experimental as the artists want them. This past February, children and adults enjoyed the Kid's Level show that displayed art work at the height of children; for several years viewers were fascinated by the different perspectives in the March Flower show, in which artists painted the same display of flowers. Many artists have had one-person or two-person shows, and last year the gallery hosted the traveling Vermont exhibit to increase breast cancer awareness, which gave guest artists an opportunity to share their experiences in related workshops held at the gallery. The possibilities for shows are endless. As an artist member the opportunities for giving and receiving are multifold. WAG empowers members to be actively involved in the operations and development of the gallery. There are basic responsibilities for every member: payment of annual dues and show rent fees, at least 2-1/2 hours of gallery sitting a month, serving on a committee (e.g., reception, marketing, hanging), and attending quarterly membership meetings. Beyond these responsibilities, members can further their involvement and professional experience by curating shows, serving on the Steering Committee or more than one committee, leading workshops for the members and/or the local community, or developing any idea that would contribute to the mission and activities of WAG. Current member Marilyn Allen has taken full advantage of such opportunities: "Co-curating a Salon Show with 114 pieces was a wonderful experience on so many levels!" WAG is always exploring ways to build its capacity and outreach to artists and the local community. The gallery plans to offer its space to local artists' groups, organizations, and performers to expand the relationship between the gallery and the community and to increase support for the arts. Additionally, the gallery is exploring funding possibilities to help subsidize the monthly show fees to minimize the costs for artists; and the gallery is broadening its artist membership to include craftspeople who are involved in creating one-of-a-kind, decorative works -- we highly encourage interested craftspeople to apply now. 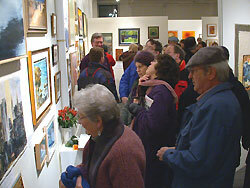 Applications for any interested artist are available at the gallery and are reviewed monthly by the Steering Committee. To learn more about any of these exciting opportunities, or to become a volunteer, please contact the gallery. Current artist members represent a range of media, including painting, photography, sculpture, crafts, digital images, paper cutting, and print making: Marilyn Allen, Marilyn Buhlmann, Ric Campman, Bob Cantius, Stuart Copans, Cia Devens, Ralph DeAnna, Lillian Farber, Jim Giddings, Marie Gorst, Judy Hawkins, Lesley Heathcote, Diana Heiskell, Nan Hemingway, Cynthia Houghton, Karen Iglehart, Deb Lazar, Linda Mahoney, Susan McDormand, Barbara Merfeld-Campman, Petey Mitchell, Cary Nelson, Scott Nelson, Hugh Roberts, Melissa Scheid Frantz, Lori Schreiner, Linda Striedieck, and Kathryn Wallace. The gallery offers such a range of work that you are more than likely to find pieces to your liking. Bios and work samples for each artist member may be viewed in a set of artist binders at the gallery. WAG appreciates the support of volunteers who sit at the gallery and help with special events: Beverly Alberts, Deni Bergne, Deborah Casdin, Jean Ciannavei, Arlene Distler, Susan Dunnington, Avis Ellis, Nancy Fisher, Lisa Franklin, Phyllis Grossbaum, Helene Henry, Tina Krampetz, Alison Latham, Eve Leons, Heidi Mario, Lee Moore, Cynthia Patriguin, Faith Pepe, Don Skekel, Jan Wall, John Wilcox, Toby Young, Tom Zopf. Emily Hague serves as the gallery coordinator responsible for daily operations of the gallery and is the main contact for WAG. We invite you to stop by the Windham Art Gallery whether you are visiting Brattleboro for the weekend, need a relaxing moment during your lunch break, are interested in becoming an artist member or volunteer, or are looking for that something special to fill a space in your home or office. We thank the community for its ongoing support in helping to maintain the vibrancy of the Windham Art Gallery these past fourteen years. We look forward to the next fourteen.